Every Italian American household has a version Sunday Gravy sauce and everyone will tell you theirs is the best. We all guard the recipe with our lives so don’t expect to see one here, but what I will give you is the story of one of the most treasured family traditions and a few tips on how to get it done. 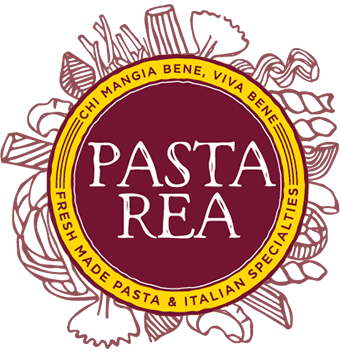 And if you don’t want to cook your own, PASTA REA sells it by the quart so just give us a call. 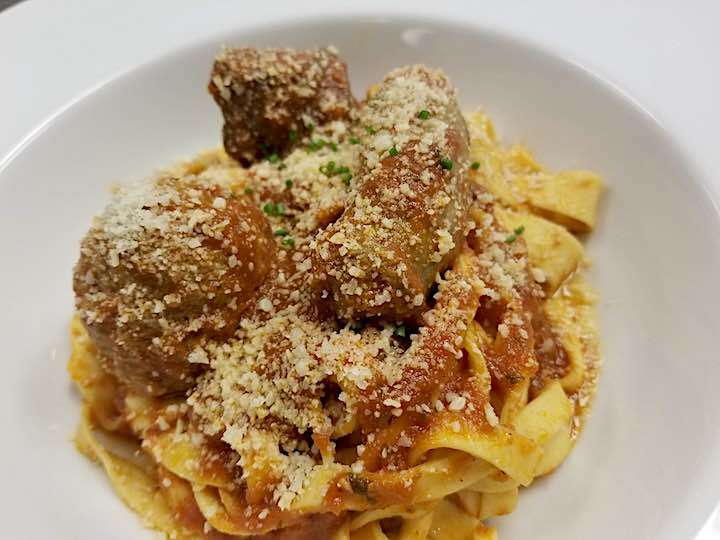 Sunday Gravy is more Italian American than Italian and features generous portions of beef or veal, pork, and sausage. Most Italian families who immigrated from the old country rarely prepared recipes with beef. Once they settled in the states and prospered financially, beef became more of a staple ingredient and you will often find beef braciola included in many recipes. Our family’s gravy relies on the flavors of the family meatball recipe which includes quality pork shoulder and handmade sausage. Sunday Gravy is so much more than just another day’s meal. Typically the sauce was placed on a slow simmer for hours early in the day. The Sunday meal was usually served around 2:00 in the afternoon. While the gravy simmered on the stove various family members would arrive to the house in anticipation of the meal allowing us time to catch up on the past week’s activities. The house would fill with the aroma of garlic, garden fresh tomatoes and basil. Of course the gravy had to be tested for quality insurance. This process would include a small plate with a ladle of gravy mopped up with a generous portion of crusty Italian bread passed around to whoever was in the vicinity. On occasion a meatball might make it to the tasting plate but very rarely. If you were caught “tasting” on your own while Mom stepped away from the stove you would receive a swat from the same wooden spoon used to stir. God forbid we ran out and there was not enough to go around. But that was the funny thing about Sunday Gravy, there was always enough to go around for those invited and for those who just dropped in and usually there were leftovers. Two or three times a month we would enjoy our meal and then head out to visit our aunts, uncles, and cousins. My mother’s father lived with us and her brother and sister would usually join us at our home. My father was the youngest of 7 and being the youngest, he would show his respect by packing us into his car and making the 30-minute trip spending about 45 minutes at each home. No matter how full you were from your mom’s gravy you were still expected to eat more. Each of my father’s sisters married a man from a different part of Italy so each home had a different preparation. One was spicy, one had raisins and pine nuts in their meatballs, one preferred boxed pasta and one handmade and so on as traditions dictated. Our tradition on those visits was to always visit Auntie Ann’s home last because she was the baker in the family. To this day I have never seen a larger display of Italian cookies and pastries than the ones that were displayed at many cousins’ weddings. Here are a few tips when preparing Sunday Gravy which is a very simple recipe to create. Be sure to use only fresh ingredients. Brown the meat, (but never the meatballs) in a quality olive oil, allow simmering for hours until the pork is fork tender and then add the meatballs and sausage until just done. That is a very important step because the flavors imparted from those meats during the simmer make the sauce. The final product should be thicker than marinara so a little paste is ok if you like but the slow reduction will help with consistency. Be sure to have lots of quality bread, grandpa’s wine and of course PASTA REA pasta. I don’t know why they call it gravy instead of sauce but that is a great topic to debate while it simmers. Roasted Beet Pasta With Chevre Cream, Garlic & Chive is a beautifully colored Fall pasta dish and it is equally delicious! 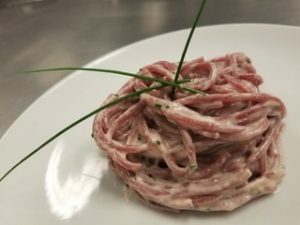 We particularly like the chèvre cream, garlic, and chive sauce to enhance the flavor of the ever so subtle beet flavor of the pasta. Our fresh Pasta Rea pasta cooks in only 3-4 minutes so this is a quick and easy dish for busy week nights or it’s impressive as a dish for entertaining guests. A simple salad and a crusty loaf of bread is the perfect accompaniment to Roasted Beet Pasta. And if you want to get fancy, mimic the chive “spikes” in our photo! Bring the water to a rolling boil and add sea salt. In a medium sauté pan, add the olive oil and garlic. Sauté stirring constantly so not to burn for about 1 minute. Add white wine and reduce by half. Add heavy cream and reduce to thicken, add cheese and stir to a smooth consistency. Cook pasta to al dente and strain, reserving some pasta water. Add strained pasta, salt, lemon juice and chives to the cream and cheese mixture stirring with a large pasta fork until well coated with sauce. You may use some of the pasta water to adjust sauce consistency if needed. Portion pasta evenly on four plates and top with a generous portion of cracked pepper. Serve immediately. Pasta Puttanesca is an Italian pasta dish invented in Naples in the mid-20th century. Its ingredients typically include tomatoes, olive oil, anchovies, olives, capers and garlic making it a very cost-effective dish. 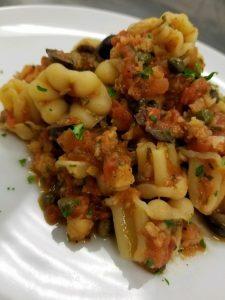 Chef Tony has created a “twist” on the Italian favorite with this delicious version which includes smoked shrimp, capers, and Kalamata olives. This Pasta Puttanesca version with shrimp is also cost-effective and prepared with our fresh Pasta Rea pasta, it is sure to please. As pictured here, the dish was prepared with Pasta Rea fiore but any of our fresh pasta will work, including long noodles such as spaghetti. Our fresh pasta cooks in 3-4 minutes so be sure to not overcook, preparing it to al dente. Serve Pasta Puttanesca with a simple green salad or Caesar salad and focaccia or crusty Italian bread. Bring 1 gallon of water to a rolling boil, add 1 tablespoon sea salt. Heat oil on medium heat in a large skillet. Add shallots, garlic, red-pepper flakes. Cook, stirring 1 to 2 minutes. Do not brown or char pepper. Add tomatoes, reserved juice, capers, and olives. Bring to a boil. Lower heat to a simmer and cook for about 5- 8 minutes or until sauce slightly thickens. Add shrimp and simmer until shrimp is firm. Add salt and pasta to boiling water and cook until fresh pasta is al dente, about 4 minutes. Drain well. Stir pasta into sauce. Cook, stirring, until sauce clings to pasta, about 2 minutes. Stir in parsley and serve.